AKA: "Lignacaine (Xylocaine) / Novocain (Procaine)"
A class of many medications that "numb" nerves on contact. Local anesthesia describes the technique of numbing a region of the body by injecting local anesthetic into the tissues around an area to be operated on. Local anesthesia is often supplemented with intravenous sedation. 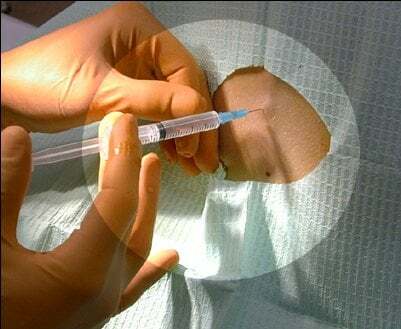 An anesthetist injects local anesthetic into the skin of the back prior to placement of a spinal needle.